Great resources for learning the principles of content marketing. Tomasz Tunguz, Venture Capitalist at Redpoint, shares a framework for evolving a startup's marketing strategy as it grows. Trust-based marketing requires an initial investment of time and energy up front, but can see you land all the clients and projects you want within six months to a year. Best of all, trust-based marketing doesn't cost a lot to implement. Be sure you comply with laws against deceptive or misleading advertising. Required reading before you do any type of advertising. Communitelligence.com is a member knowledge-sharing portal aimed at improving organizational and interpersonal communication. At the center of Communitelligence are 30 expert-led communities focusing on key topics including public relations, internal communication, marketing, presentation skills, writing and business strategy. A directory of the contact information of the most popular tech websites, newspapers, bloggers, and reporters. The directory includes emails, contact URLs, Twitter accounts, and added additional comments. Easy-to-understand information on public relations for emerging tech companies. How to set goals, develop plans, measure, and quantify results. HBS Working Knowledge is a forum for innovation in business practice. This link directs the reader to the marketing strategy section of the HBS forum. A comprehensive guide for entrepreneurs who want to handle their own PR. "How certain diagnostic and analytic tools can help spread your online influence and spark interest in your brand"
Several articles presenting ideas for developing marketing plans. Dharmesh Shah, founder of Hubspot, speaks at the MIT Startup Bootcamp about the startup experience and inbound marketing. Hubspot Academy offers an online curriculum of inbound marketing webinars taught by a faculty of top marketing experts. Marketing communications articles, book reviews, glossary, profitability calculators and other related resources. Free, Java-based calculators for estimating the profitability of clicks- and impression-based Web advertising and direct mail campaigns, as well as the lifetime value of customers. This site provides articles that will give you insight to successful business and marketing practices. Learn how to attract and maintain a solid consumer base. Learn various sales techniques or review familiar ones to stay fresh and ready for that new client. Marketing know-how from professors and professionals. Marketing plan software and sample marketing plans. NamingForce will help you crowdsource a name for your business. They average over 1,000 possible names for each contest. They then have the crowd vote on the results, and they conduct U.S. trademark and domain name checks to make sure the name is available. Affordable online press release distribution. Softwarepricing.com is a resource for companies facing pricing decisions or feel their pricing or discounting practices are "not quite right". The site is created by MarketShare, Inc. a MA-based management consultancy focusing on technology-based product (and service) pricing issues. Note to reader: While I think the site is outstanding, please look it over and rate it your self... Thanks. David Cowan of Bessemer Venture Partners describes the Sales Learning Curve, developed by Stanford Business Professor Mark Leslie. The gist: between product development and sales ramp-up, there needs to be a period in which you figure out how to perfect what you have to sell. Eloqua's guide to getting up and running with social media marketing. This is a 6-Month action plan for going from nothing to having a comprehensive digital marketing operation. It walks you through just about everything you need, step by step. It's an awesome resource. Rather than overstaffing a sales force up front and saddling it with unrealistic performance expectations - a typical mistake most new firms make - entrepreneurial managers should initially employ only a small cadre of salespeople and allow them to work with customers and product developers to smooth out the kinks that are likely to occur. Tactics for attracting initial customers, primarily through content marketing and public relations. The author argues that better marketing can help companies better compete for the remaining market and can help small businesses in particular in building their brand and developing trust in the company, allowing them to leapfrog competitors who do cut back during the downturn. "New York Times bestselling author and social media expert Gary Vaynerchuk shares hard-won advice on how to connect with customers and beat the competition. A mash-up of the best elements of 'Crush It!' 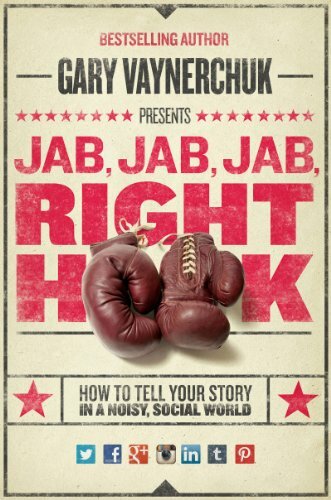 and 'The Thank You Economy' with a fresh spin, 'Jab, Jab, Jab, Right Hook' is a blueprint to social media marketing strategies that really works."